Are you looking for a snowbird rental? Panama City Beach, Florida offers senior snowbirds many options that are both affordable and attractive. If you plan ahead, your winter can be filled with the sunshine and sandy beaches that attract many snowbirds to the Panama City Beach area each winter. Panama City Condo Rentals feature lodging options at the Summit, Regency Towers and Gulf Crest. Snowbirds can take advantage of winter rental specials, lower in price than other seasons, as well as discounts for two and three month periods. Snowbird Helper is a site devoted to helping seniors find options for winter rentals. They offer private condo rental listings for Panama City Beach and include contact information, such as the owner's name and phone number so that you can contact the owner directly, as well as a website that contains photos of the listing. Nestled between St. Andrews State Park and the beach, the Panama City Beach RV Resort is surrounded by natural attractions, and full of creature comforts from WiFi service to cable TV. Seniors spending the winter in Florida can enjoy an excellent community and experience at this park. There are also condo and studio rentals at this facility if you don't have your own RV. Florida Snowbird is another great site to check out. 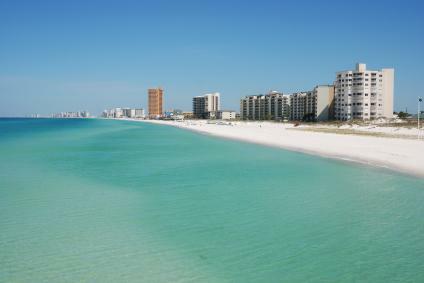 This site features condo rentals, beach home rentals for Panama City and Panama City Beach. Another unique feature of Florida Snowbird is that the rentals available during winter are discounted and available for periods when snowbirds tend to migrate to the area. Rental owners tailor each unit to fit the needs and lifestyles of snowbirds. The Panama City Beach Chamber of Commerce is another great resource for finding a snowbird rental. The Chamber has a listing of vacation rentals, vacation planning tips as well as news and updates on the Panama City Beach area. Snowbirds can check the Chamber for lists of activities and events going on throughout the season as well. In addition to searching for snowbird rentals online, there are other options to consider as well. Many local travel agents may be able to assist seniors in finding rentals in Panama City Beach during the winter months. Owners may also list their rentals at senior centers, in church bulletins and on community bulletin boards. Word of mouth can often be the best way to find a great place to rent during the winter. If you know someone who has stayed in Panama City Beach or have family that lives in that area, asking them for recommendations on rentals. Since Florida remains one of the most popular destinations for snowbirds, booking a rental in advance is highly recommended; it is also a good way to ensure a discounted snowbird rental price. Many seniors request a rental before they leave for the season so that they are guaranteed a place at least a year in advance. Some rental companies do not reserve rentals that far in advance, but often can accept a request to give priority once a rental becomes available. During the winter season, many seniors flock to destinations such as Panama City. Wanting to escape the cold temperatures and harsh conditions, these snowbirds are attracted to the area due to its mild climate and plenty of offerings geared towards senior citizens. Panama City, located along the west side of Florida and nestled between the Gulf of Mexico and St. Andrew Bay, is especially popular for seniors due to its relatively crowded beaches and fewer spring breakers. The beach is known for its white sands and emerald green waters, making it perfect for relaxing as well as for activities.